On January 17, 2019, renowned American poet Mary Oliver passed away. New photos every week! Check out the gallery. This Indigo Bunting courtesy of Kelly Colgan Azar. 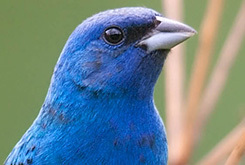 Many Indigo Buntings migrate in large flocks across the Gulf of Mexico this time of year. The males sport bright blue plumage during breeding season, while the females remain a muted tawny brown. These persistent singers feed mainly on seeds and insects. 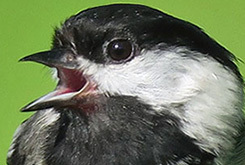 BirdNote is funded by people who value our work on behalf of birds and the natural world. Your financial support directly affects our ability to tell stories and share them with more than 2 million listeners, online and on air. Thank you!